The exhibition of acrylic paintings by Enid Williams continues at Piedmont College through Friday, April 3 (closing at 5 p.m.). If there's any chance you can see this exhibition, by all means do so! I had a wonderful experience at the reception, looking at the paintings and listening to Enid Williams talk about her paintings and process. Acrylic painting © Enid Williams 2012 - "Elastic Collision #7" on 12" by 12" panel. Image used by permission of artist; all rights reserved. Do Enid Williams' paintings achieve her aim? Before going to the reception, I had checked out Enid Williams' website. 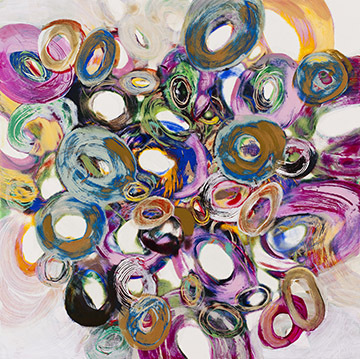 One phrase from her artist statement caught my attention: "As an artist, I am interested in slowing the viewer's gaze...." So when I entered the gallery at Piedmont College and began to look at her paintings, I wondered if I'd experience them as holding my attention enough to slow my gaze. I felt a surge of congratulatory appreciation for Enid Williams. Here's an artist who set an aim and has clearly achieved it! This lifted my spirits. Yes but what about spirituality? 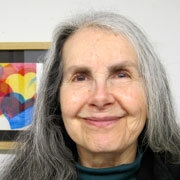 Enid Williams at her exhibition, "Echolalia," at Piedmont College in Demorest, GA. Photo courtesy of Piedmont College. Image used by permission of artist; all rights reserved. As her talk began, I looked at the paintings behind her -- now from a longer distance. I thought "Yes, these paintings achieved her aim, that's great. But they're not really spiritual. Too bad." Then I realized how ridiculous this thought really was. Here's an artist whose paintings affect the viewer's experience of time, making it deep and slow and also playful and expansive. And I'm saying they're not spiritual? Come on, Cathy! Get real! So this is why I urge you to see these paintings in person whenever you get the opportunity. If you can get to Piedmont College in Demorest, Georgia, by the afternoon of April 3, that's a sure bet. The Mason-Scharfenstein Museum of Art is on Georgia Street in downtown Demorest, GA. Regular Hours are 9 a.m. to 5 p.m., Monday through Saturday. Plenty of parking is available in the visitors' lot right behind the art museum. Of course there's much more to see in these paintings by Enid Williams than my own story tells. She deliberately uses her vocabulary of circles plus a subtle use of color to invite a wide range of personal interpretation. Your story will be unique. I admire the way she combines gestural spontaneity with careful craftsmanship. This level of craftsmanship, especially in preparing the birch panels, requires a lot of patient labor. It's the only way to go (in my opinion) yet isn't always what artists do. Enid Williams has a lot of interesting things to say about her work. I remember her saying she enjoys putting a bit of irony and humor into the painting titles. I think of myself as kind of a "word person" so it surprises me that I just wanted to gaze at the paintings and enjoy the way they transformed my sense of space-time. I had to nudge myself to look at the title cards. I think this shows the power of the paintings as paintings; to me, going way beyond words is what it's all about. You can see more photographs of the exhibition and reception posted by Piedmont College at Flickr. There's also a delightful interview with Enid Williams by Kenya Chaney, posted online at the college newspaper. If you can't get to this exhibition before it closes April 3, you can keep in touch with the artist by contacting her via Enid Williams.net. There's also a blog showing some Enid Williams paintings from 2013. Clearly Enid Williams spends more time painting than updating her blog and website. This is too bad for us but not something I would want to change.